Home Uncategorized Tear Down Monuments? Why Not Start With Those Glorifying Palestinian Terrorists! Tear Down Monuments? Why Not Start With Those Glorifying Palestinian Terrorists! Tearing down statues has become a major issue in the US these days, although one could argue there are countries where the problem is more pressing. Protesters have gone from demanding that the Washington Redskins change their name to advocating the removal of statues honoring the Confederacy. In the former case, they claim that name of the football team uses a disparaging name for Indians. In the latter case, they claim that Confederate statues honor what the Confederacy stood for — owning slaves. The protests go beyond just anonymous confederate statues. There are demands that statues of General Robert E. Lee be removed as well. The demands go beyond leaders of the Confederacy, to include removing the statues of slave owners in our nation’s history, including Andrew Jackson, Thomas Jefferson and George Washington. The demands go beyond American slave owners, to Christopher Columbus. If #RobertELee is to be erased from history, why not erase #ChristopherColumbus whose arrival ignited genocide of Native Americans? If action is to be taken on these various targets, the first step should be to figure out if there is an issue to begin with — are people really offended? For example, last year the Washington Post reported New poll finds 9 in 10 Native Americans aren�t offended by Redskins name. An NPR/PBS NewsHour/Marist poll last week found that 62 percent of respondents thought statues honoring leaders of the Confederacy should �remain as a historical symbol.� Only 27 percent of those polled wanted the statues removed. It is noteworthy that, by 44 percent to 40 percent, African Americans did not support removing Confederate statues. If action really is to be taken on statues, monuments and football team name, it should be done democratically, and reflect the opinions of those people who are assumed to be offended. Contrary to the protesters, we don’t seem to have reached that point yet and tearing down those statues at this point is just vandalism. A better case could be made against Mt. Rushmore, which was built on land that was seized from the Lakota Indians after the Great Sioux War of 1876. Previously, the Black Hills had been granted in perpetuity to the Lakota under the Treaty of Fort Laramie in 1868. However one feels about the Confederacy and the reasons behind the Civil War, the statues themselves are not dedicated to slavery or its defense. It was part of the of dealing with the war and its aftermath. A different case can be made for Nazi Germany, where statues, monuments and stadiums were seen as a way of glorifying and paying tribute to the Nazi ideology. Not surprisingly a better case for tearing down statues, with a broader consensus, was made following the defeat of Nazi Germany. One might have thought that tearing down statues and monuments would be enough for Germany to leave its Nazi past behind. Yet history tells a more complicated story. In its initial years, de-Nazification had only limited impact. It would take time, generational change and external events to make Germany what it is today�a vibrant democracy that is notably less permissive of racism, extremism and fascism than the United States. Tearing down the symbols of Nazi terror was a necessary first step�but it didn�t ensure overnight political or cultural transformation. It required a longer process of public reconciliation with history for Germans to acknowledge their shared responsibility for the legacy of Nazism. We can argue over to what degree the US needs to have a similar reconciliation with its past, especially of the Confederacy. The US in fact might not need to go through the same kind of healing process that Germany did. 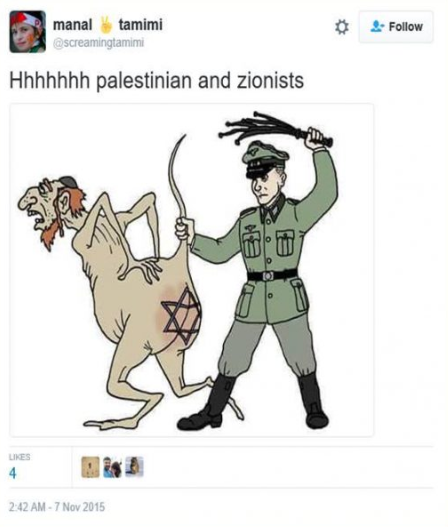 But the Palestinian Arabs do, whose anti-Israel and antisemitic cartoons still make use of Nazi imagery. Tweet by Manal Tamimi, Al Jazeera’s “supermom”. The Jenin municipality last month named a square after �martyr� Khaled Nazzal, a Democratic Front for the Liberation of Palestine (DFLP) operative who planned a massacre in the northern town of Ma�alot in which Palestinian terrorists murdered 22 schoolchildren and four adults. It also erected a monument in Nazzal�s honor. When the IDF took down the statue, it was put back up the next day. In July 2016 Abbas ignored Israel’s request and went ahead with a monument honoring the late Palestinian terrorist Ahmad Jabarah Abu Sukar. Known as “the refrigerator bomber,” Abu Sukar planned the detonation of a refrigerator filled with explosives in the center of Jerusalem, murdering 15 people and wounding more than 60. The monument describes Abu Sakar as a “heroic martyr” — an example to emulated if not glorified. The woman being honored, Dalal Mughrabi, was the 19-year-old leader of a Palestinian squad that sailed from Lebanon and landed on a beach between Haifa and Tel Aviv. They killed an American photojournalist, hijacked a bus and commandeered another, embarking on a bloody rampage that left 38 Israeli civilians dead, 13 of them children, according to official Israeli figures. Ms. Mughrabi and several other attackers were killed. While the confederate statues are a reminder of the slavery and abuse suffered, those monuments do not glorify it. While the Nazi statues glorify the leaders of the party and of Nazi Germany, they did not explicitly glorify the murder of Jews. Most of the concentration camps themselves were in Poland. Germans at the time did go along with sending Jews to the camps and the gas chambers, but when confronted with the facts, they still retained a sense of shame. On the Palestinian leadership of Hamas fires rockets indiscriminately at Israel, without regard as to whom may be hit. They also encourage attacks on Israeli civilians. For their part, Abbas and the Palestinian Authority incite hatred against Israel through the glorification of terrorists, whether through monuments, programs or the preaching of radical imams. The Confederacy and Nazi Germany are in the past. The Palestinian Authority and Hamas are now in the 21st century inciting hatred and murder out in the open in a way that would surprise the Nazis.The West, meanwhile, turns a deaf ear to this in a way that would make Neville Chamberlain seem like a brave man of integrity. No one expects those same US protesters to take note of all this and make an issue of Palestinian statues glorifying murder half way around the world, but one would think that at the very least they would demonstrate an awareness of the situation, instead of making excuses for it. If statues and monuments are going to come down anywhere, statues and monuments glorifying Palestinian terrorists must come down as the very first step towards an honest peace plan. Statue of Yasser Arafat in Mexico City, Mexico.